Some tips for researching your geneology. Start with what you know. 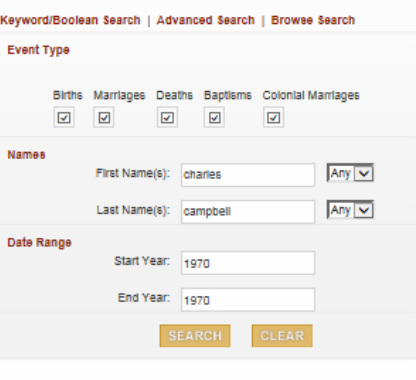 If you don't have accurate names or dates to identify your ancestors, work back from yourself or your parents. Your parents' birth certificates, for example, will give you the full name of your grandparents. If you know a date of death within five years or so (or a date of birth), this will help. In Canada, vital statistics of marriage, death, and birth are held in provincial archives. Some provinces provide digital databases; others do not. Below is a link to BC Archives and some suggestions for how to search. Information about other archives can be found on Library and Archives Canada's website: http://www.collectionscanada.gc.ca/022/022-906-e.html. Did Your Family Homestead in Western Canada ? Check out Land Grants of Western Canada 1870-1930 from Library and Archives Canada. Click on the Search link on the left side of the page. 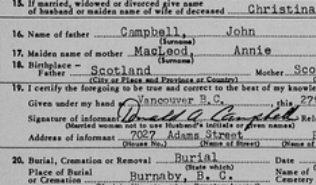 My search for my grandfather in the BC Archives started with his name and the year of his death (see the search box on the right). The search took me to a page with details of my grandfather's death, including a link to an image of his actual death certificate. Reading the death certificate, I was able to find out the names of my great grandparents, my grandfather's date of birth, and the place he was born. British Columbia Historical Newspapers. UBC has digitized an extensive collection of local newspapers from around the province dating back to 1865. You can look for specific newspapers here: http://news.google.com/newspapers. CBC Digital Archives contains thousands of news stories that have been organised into categories including lifestyle, music, and sports.